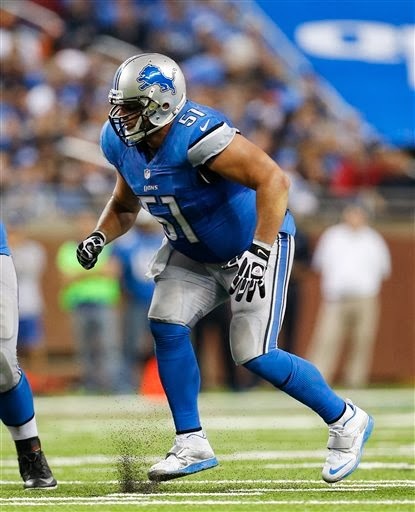 The Detroit Lions are looking into reports that veteran center Dominic Raiola made profane comments to members of the University of Wisconsin marching band during pre-game warm-ups at Lambeau Field on Sunday. From the blog, Raiola was yelling at a band member saying, “Hey fat guy, you want a hot dog?’’ Plus allegedly several profanity-laced insults. Also from the blog a band member said Raiola made comments insulting his sexuality, his sister and his recently deceased mother. “I’d be very disappointed if that was the case because that’s certainly not the character we want to display,’’ Schwartz said. Some of the comments were allegedly made just before the band played the national anthem. Schwartz said he’s not sure where Raiola lined up for the anthem. “... I’d be surprised if that happened in those circumstances, but we’re going to look into it, if it did happen we’d be very disappointed in that behavior,’’ Schwartz said. The blog reports that Raiola was not provoked and that his teammate Louis Delmas apologized to the band and told them he enjoyed their performance. If reports are true this is not the first instance of Raiola interacting with fans in a negative fashion. In December 2010 he was fined $15,000 by the Lions for taunting a fan in Miami after a Lions’ win. In December 2008 he was fined $7,500 by the team for making an obscene gesture toward fans at Ford Field after a loss dropped the Lions to 0-13. Raiola’s brother Donovan played football at Wisconsin. The veteran center played in his 193rd career game on Sunday.